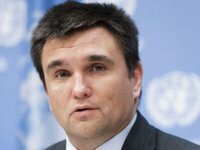 Minister of Foreign Affairs of Ukraine Pavlo Klimkin has reported on a large-scale disinformation campaign in the eastern and southern regions of Ukraine regarding the circumstances and details of the attack of Russian security forces on the ships of Ukraine's Armed Forces' Navy near the Kerch Strait on November 25 and the capture of Ukrainian sailors. Russian "fakes" are being spread in the eastern and southern regions of Ukraine via social networks saying that "sailors planned large-scale provocations to stir up the situation before the elections, in particular, to blow up the bridge across the Kerch Strait," the minister said on his Facebook page on Friday. "I am convinced that the main thing in any situation is people. And you need to talk with them. You need to go to the regions that are the target of this large-scale disinformation campaign. In the near future I plan to do this," wrote Klimkin on Facebook on Friday.